We left last Monday for Family Camp up at Shaver Lake. We were there for 5 days and 5 nights. It was a week of fun - that's for sure. Jeremy and I both decided we could've stayed a few more days. We've done this same camping excursion for the past 7 or 8 years in a row now and we LOVE IT! The kids always have a blast doing everything they're not allowed to do at home (staying up late, eating junk food from dawn till dusk, playing in the mud, throwing their food on the ground, playing with fire, and playing playing playing all day long). And when I say "kids" I do not use that term loosely. This was no measly family camp. No, no, no... there were 30 kids for 3 days straight and 36 all together including those that came and went. And that's just the kids - there were adults there too! We were alone most of the week. We camp in a semi-private campground and were lucky that there was only 1 other family there besides our group for about 4 of the days. We could be as loud as we wanted - early or late. We always say that we do these camping adventures for the kids, but I don't know anymore. I know all of us adults really enjoyed most of our time there. 10. Trevor and Logan slept in their own tent. Ahhhhhh. They are finally old enough to branch out on "their own" and sleep away from mom and dad. It was a small distance they slept from us, but a huge leap for our family dynamics. 9. Little blue screens in every tent at bed time. We are pretty lucky in this campground to have electricity at our fingertips. So every night most families would put the kids to bed for a little wind down time and turn on a movie for them. It was pretty comical to be in the great outdoors and see little TVs set up in every tent after dark. 8. Lizzie's crush. We made some new friends this week - a family that the Minnicks know from their Turlock days. About 2 minutes after they arrived Lizzie came over to me and said, "Mommy who's my new friend?" There were 4 kids mind you and she zeroed in on one - instantly. She and "New Trevor" were glued at the hip for the rest of the stay. 7. Putting the kids to bed and then hanging out with just adults every night. This was soooo enjoyable! It was like a mini date night where we could feel sane again playing games and talking about things other than kids for awhile. 6. The food. Oh yeah. We ate like camping royalty. Mexican food, ableskivers, pulled pork sandwiches, burgers and dogs, homemade chili, campfire treats every night, lunch served on the beach, oh baby it was great. Matt and Aimee even bought pizza one night - the kids were in hog heaven! 5. Watching Trevor ROCK OUT during kareoke night. We've NEVER seen him get out of his shell like that. He's usually mister quiet/reserved boy, but that night something happened. He was dancing like crazy and even sang a duet in the microphone with Jacob - and we didn't even have to twist his arm! 4. Campfire stories. 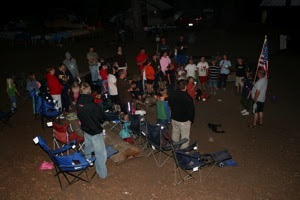 Grandpa Doug rocked our campground with his traditional telling of the scary stories. He had all the kids captivated for about an hour and then sent them to bed. About 7 of them woke up that night in a nightmare terror. 3. The frog in the shower. Buffy went in to take a shower one night after dark and as she went in she reached around to turn on the light a slimy something slithered across her bare foot. She let out a blood curdling scream and came running out. A few minutes later we found a slimy green frog climbing the wall. Ew, ew, ew! 2. YMCA. All I have to say is Jared, Matt, Jeremy and Robb dressed up (sort of) like the Village People and singing all the wrong words. We haven't laughed that hard in a long time. 1. Matt got pulled over by the Shaver Lake Sherrif for having too many bodies on the boat with life jackets that were either too big or too small for most of the passengers. They got off without a ticket, but the officer was "nice enough" to hand out whistles to all 30 kids that were there that day. All the adults agreed we'd rather have had the ticket. Wow! I made your top 10. I guess it was worth it thinking that a snake was slithering across my foot. It was another great week. Do you think we could do it again one more time this summer? I want to know what program you used to edit and make that video! You did a great job!